In 2016 it was suggested by members that the MWA should have its own National Standard. This was agreed and thanks to Lieutenant Commander Bob Hawkins Royal Navy, a member of the association, the purchase was generously funded by the Masonic Lodge in Queensferry, Scotland in recognition of the long standing links between the lodge and the Royal Navy ‘small ship’ community when based in Port Edgar and later, Rosyth. Ex CPO(MW) Sam Cook volunteered to oversee the procurement and design of the Standard to meet the requirements of a National Standard using his experience as the TON Class Association Standard Bearer. Sam identified a company called Newton Newton Flags Limited who have vast experience in the production of Standards for a plethora of organisations including those related to the British Legion. After a lot of deliberation and guidance, the company produced a 1st Class Standard for the MWA which passed a very strict scrutiny by Sam. Delivery was very timely for the MWA 10thAnniversary celebrations. At the 2018 MWA Annual General Meeting held in the Maritime Club in Portsmouth, the Standard was paraded by Sam and revealed for the 1st time to the MWA Membership before being dedicated and blessed by the MWA Bish, Mrs Debbie Harvey. 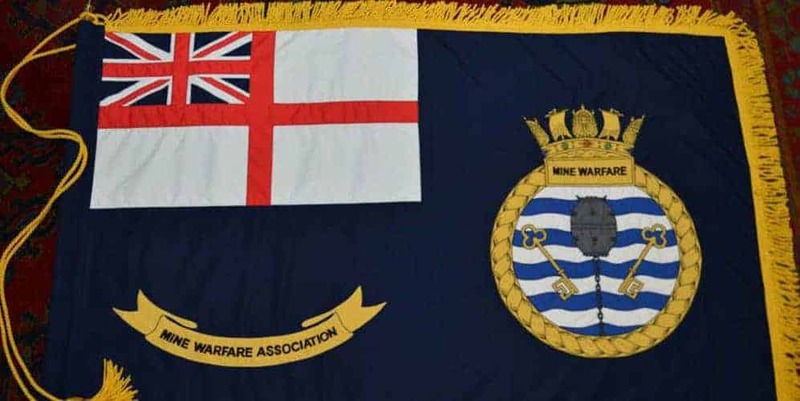 Sam also volunteered to parade the Standard on its inaugural parading at the MWA 10thAnniversary Reunion Dinner onboard HMS WARRIOR 1860 before the honoured guests and the Guest of Honour, Captain Roger Readwin Royal Navy (Captain Mine Warfare, Fishery Protection and Patrol Vessels (CMFP)). Sam has the honour of the Standards first outing. The first public parade was at the 2018 Armed Forces Day Parade in Weymouth on 24 June 2018. Sam spent some time training volunteer ExCPO(MW) Topsy Toner on the fine art of being a Standard Bearer (and there are rules!!). On the day, Topsy and Sam marched proudly at the head of the parade and the Royal Navy Contingent along the entire seafront in Weymouth witnessed by several MWA members……but that is another dit. The Standard will be paraded wherever possible at the right sort of remembrance parades and Armed Forces days where a volunteer Standard Bearer is available. It will also be paraded at the passing of MWA Members where requested providing a volunteer bearer is forthcoming. The new MWA sash. High quality and does us proud!